Time: Press 10 seconds with silcone cover sheet. Peel cover sheet cold. Specially formulated for non-oil type laser printers and copiers. 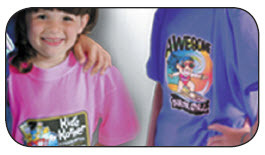 Use on dark colored 100% cotton, poly/cotton blend shirts & nylon fabrics.